This article will explore my thoughts on The Force Awakens, what elements in it should be kept in the next film and what should change going forward, my hopes and expectations for the next movie, what we know so far about The Last Jedi thanks to previews and interviews, as well as facts you might not know that are gathered from canon Star Wars novels. Spoiler warning for upcoming Star Wars movies, the canon novels, as well as an epilepsy warning for flashing GIFs. We have a lot to delve into, so let’s get started! There’s a fun game that filmmakers play with their fans where they will purposely give viewers certain expectations, make the audience think they know what’s going to happen, then subvert those expectations by instead going in a direction the audience never saw coming. Little hints of the truth will be left here and there so that when fans rewatch the films after they find out what’s really going on, they’ll think, “How could I have missed that?” This is exactly the game the Star Wars filmmakers are playing with us now, and the time will soon come when the curtain is drawn and the true direction of this new trilogy will be revealed. Even the trailers foreshadow this. If you’re like me, you like to be ahead of the game and try to guess ahead of time what the filmmakers might do. This guide is here to help you do that. But in order to do so, we have to keep our eyes open and ask questions. What incorrect things are the filmmakers trying to make us believe? What false directions are they pushing us toward in order to hide the true path? And where does the true path lead? To start off, let’s take a closer look at the previous film in the Star Wars franchise, where I’ll recap where the story has taken us so far as well as give a few opinions on where the filmmakers did well and where they can improve. The first movie in the new Star Wars trilogy introduced us to Rey, a young scavenger who lives on the desert planet of Jakku. We don’t know who she is or who her parents are, but she is still awaiting their return. We meet Finn – a former stormtrooper who eventually joins forces with Rey. And we meet a Resistance pilot named Poe Dameron whose BB-8 Unit carries part of a map to Luke Skywalker, who has mysteriously gone missing. The old Empire has arisen once more, this time in the form of the First Order. 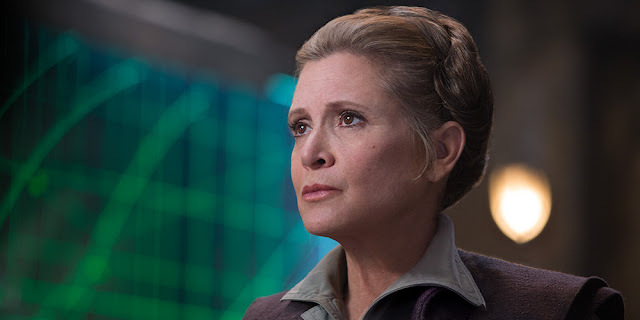 Princess Leia returns as General Leia, fighting against the First Order and hoping for the return of her brother. Rey and Finn join up with Han Solo and Chewie, and the gang eventually heads to Maz Kanata – a force-sensitive pirate queen who gives Rey a lightsaber that, in turn, gives Rey a mysterious Force vision. We meet the new baddies: General Hux, Captain Phasma, their mysterious leader Snoke, and most importantly Kylo Ren who, it turns out, is the son of Han and Leia. Originally named Ben Solo, Kylo Ren aspires to be like his pre-redemption grandfather, Darth Vader. His parents, however, believe there is still good in him. Han offers his son a chance at redemption, which Kylo refuses – killing his father in the process. 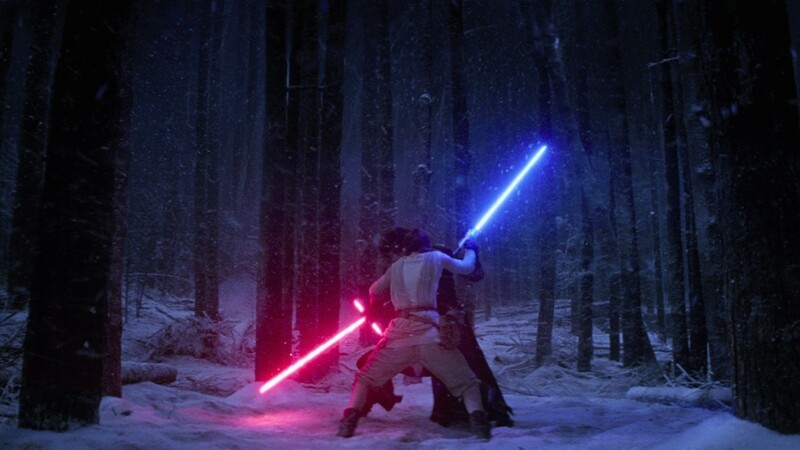 Rey discovers she has Force powers and beats Kylo Ren in battle. The Resistance succeeds in destroying a new Death Star the first order built (though not before the villainous order destroys the capital of the New Republic). And the map to Luke Skywalker is finally pieced together. The film ends just as Rey holds the lightsaber out to the long-lost Jedi. I have mixed feelings about the film, as I do with most of JJ Abrams’ films. He seems to value style over substance, emphasizing plot and action sequences over character development. As a result, most of his films are neither terrible nor great, but mediocre and rather safe. Without the Star Wars name and a few returning characters (who did not influence the plot much), The Force Awakens was not much different than any generic summer action flick. It wasn’t terrible – it keeps your interest with fairly good pacing, some cute humorous moments, some memorable scenes, etc. But it certainly could have been better seeing as this is Star Wars. Considering we waited 10 years for a new Star Wars trilogy, we don’t want a generic action movie with a few fun things scattered throughout. We want something that truly moves us, and I don’t believe TFA quite achieved that. The Force Awakens got a lot of flak for being too much like A New Hope. But ultimately, I don’t believe this was the film’s main problem. The similarities were purposely infused to honor George Lucas’s wishes for all the trilogies in his story to mirror one another. And as anyone who’s ever visited TV Tropes knows, viewers can be perfectly satisfied watching characters follow familiar events if they are sufficiently invested in those characters. The lack of good characterization, I believe, is the film’s main weakness, which I will get into more in the characters section later in this article. But while I have mixed feelings about the previous film, I have a lot of hope for the next installment. Next, let’s take a look at what we know about the characters and speculate about what could (or should) happen to them next. It was pretty cool that the Star Wars filmmakers decided to choose a woman as the main character for the new Star Wars trilogy. But what do we really know about Rey as a person? Well, we know she’s lived her whole life alone on a desert planet. We know she’s waiting for her family. We know she’s a scavenger with ace survival skills. We know she’s more or less a good person as she joins with the good guys, and, although she is tempted to sell BB-8 at one point, she ultimately doesn’t go through with it. We know she’s independent and doesn’t like strange men grabbing her hand. We know she can fly a ship, that she’s fascinated by green plants, and that she looked up to Han Solo as a father figure during the short time she knew him. We know that she has some mysterious destiny that is calling to her, that she can use the Force well without any practice, and that she may be tempted by the dark side. At first, that might sound like we know a lot about Rey. My problem is that everything we know about her reads more like a Wikipedia page than a description of a real person. If all you know about a person is where they grew up, what causes they fought for, and who they had relationships with, then do you really know them? Almost everything we know about her is situational. And many people can be in the same situation – grow up the same way, fight for the same causes – but still have very different personalities. Of course Rey is waiting for her family, since they are the only people she knows and they said they would come back for her. Of course she would view Han as a father figure when he’s the only kind adult man she’s met. Of course she would be good at surviving and be amazed by green plants, considering where she grew up. And since she’s the main character of a Star Wars film, being able to use the Force, being faced with temptation, and having a mysterious destiny are pretty much just part of the package. But what separates her from another person who might have grown up in those same circumstances? If Luke, Leia, Han, Anakin, Padme, or any other Star Wars hero took a break from saving the galaxy and came over to my house for lunch, I think I have a good idea of the kind of things I would talk about and do with each one. Because I know who they are outside of how their character serves the plot. But if Rey came over…what kind of things would she want to talk about? What sort of stuff would she want to do for fun? I have no idea. If we look at the list of things we know about Rey and take out the stuff that’s relevant only to plot and not to person, we have very little left. In fact, all we have left is that she’s not a terrible person since she didn’t sell BB-8 and that she’s independent and doesn’t want a strange man holding her hand. In other words, there’s really nothing much that separates her from your standard “I don’t need a man” heroine. 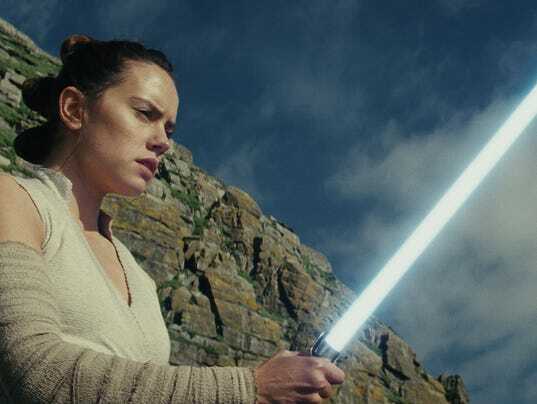 When fans first heard that Rey would be the star of the next trilogy, we were thrilled because finally we would be talking about a woman instead of a man. But now, when we talk about Rey, what do we talk about? We talk about what man might be her father, and what man might be her future boyfriend. Why? Because, at this point, those are the most interesting things about her. That’s…not great. I don’t think JJ Abrams has done her character justice at this point, and one of the things I want most out of this next movie is for her to finally develop a noticeable personality. I’m really looking forward to seeing how Rian Johnson improves her character after JJ’s take. I have seen conflicting reports on whether it is Rey’s relationship with Luke or with Kylo that will be the center of the film. But regardless of which it is, the fact that the center of the film will be a relationship rather than something plot-related may hint this film is at least more character-driven than action-driven. I just hope that, during the scenes that portray those relationships, her character is just as developed as the others. Of course, we can’t talk about Rey without discussing her possible parentage. It seems to be the number one thing fans are speculating about, and the internet is rife with theories about whether she’s Luke’s daughter, a descendant of Obi Wan, Palpatine, if she’s a reincarnation of Anakin or some other important figure in Jedi history, or even a personification of the Force itself. Let’s take this one at a time. First off, amazingly, there are still people who believe Rey might be a Solo – that she’s Han and Leia’s daughter somehow and that they just didn’t bother to tell her this when they met her. This is absolutely not true. One, because there’s no way they would neglect to tell her this. And two, Daisy has gone out of her way to debunk this theory. It’s time to let go of this one. 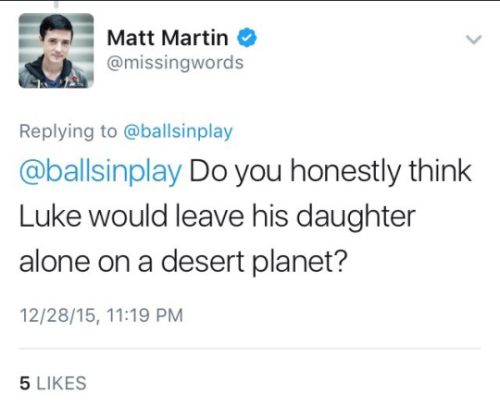 The most common theory, of course, is that she’s Luke’s daughter. And again, I have to disagree. For one thing, it would not make a great plot twist. 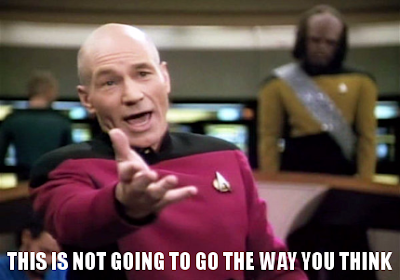 People think it will happen because it would mirror the “I am your father” scene from Episode V. But that was a great plot twist because it messed with our expectations, forcing the hero to confront the fact that his father was the villain. Rey being a Skywalker, on the other hand, doesn’t mess with our expectations and doesn’t force her to confront anything. Luke isn’t a villain she hates; Kylo is. And having a “Rey…I AM your cousin!” scene between her and Kylo would be the most laughable dramatic moment one could think of. Also, can you imagine Rey having this conversation with Luke? Take the question of who Rey’s parents are: If you get the information — oh, it’s that! — who really cares? I know a lot of people care, but it’s interesting as opposed to impactful. Poe is one of those characters who makes me feel like I’m the only one who didn’t see the appeal. 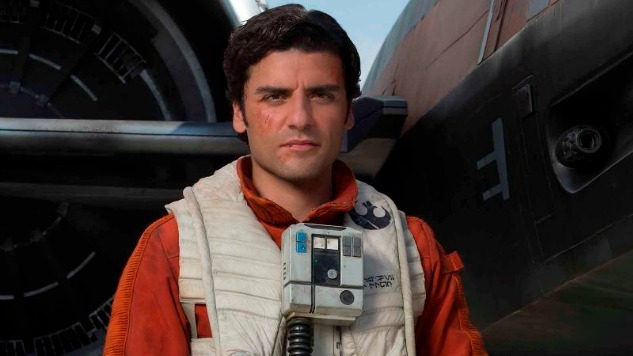 Don’t get me wrong, I love Oscar Isaac and am glad he’s in the film. But when I came out of TFA for the first time, I was pretty surprised to see he was the one everybody was talking about. Mostly because he’s such a minor character. Plus, we know nothing about him other than he’s a great pilot and has a handful of humorous lines. He got a chuckle out of me now and then, but mostly he seems like a poor man’s Han Solo so far. Unfortunately, there hasn’t been much news concerning him in the next film. We know he’ll be in it, but sources have been strangely silent on what role he’ll be playing (other than probably flying around, fighting for General Leia’s side in the war). There’s been a few rumors he could go radical, however. As well as a few whispers he might have a subplot involving General Hux. But that’s it. 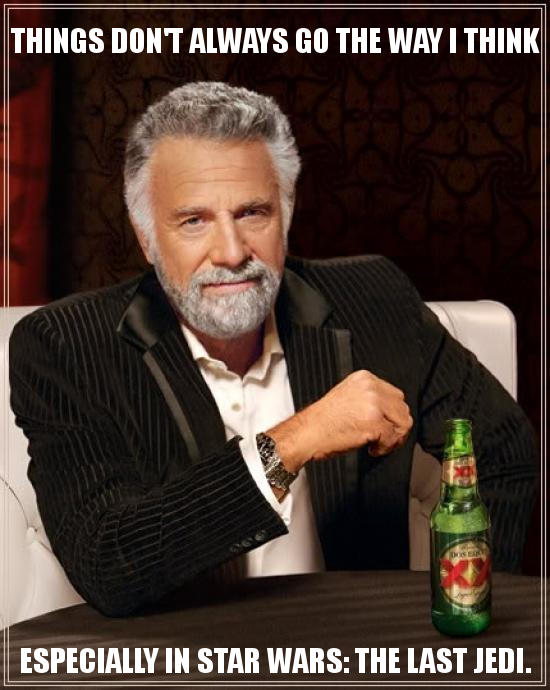 And to be honest, I’m not sure of the credibility of my sources for those rumors either. Of course, one of the main theories about Poe Dameron is that he might have feelings for Finn. While I would love to have a LGBT relationship between two main Star Wars characters (especially between these two), I don’t think it’s going to happen. Rumors about Stormpilot being canon (which seemed credible at first, as Oscar Isaac perpetuated them) have been dismissed by John Boyega as merely Isaac’s headcanon. Plus, I don’t think Disney is daring enough to follow through with such massive representation. After all the begging from fans, the new Star Wars canon recently got one of its first LGBT characters…a minor character from the holiday special who was mentioned briefly in a book. After such a tiny baby step, do you really think the folks behind Star Wars are going to jump to a full-fledged gay romance between main characters on screen? Sadly, I find this unlikely. Like Rey, I have a lot of problems with Finn’s character. He has much more personality than she does, but his motivations and character arc are confusing. People have called his character arc a redemption story, but it’s not really. He never became a villain or harmed anyone, so he doesn’t have anything to be forgiven for. And if he doesn’t need forgiveness, it’s not a redemption story. It’s simply an unorthodox hero’s story. And in my opinion, it’s not a well-done hero’s story either. When I first went into the movie, I was excited, thinking “Wow, I can’t wait to see what could make a stormtrooper defect to the other side!” Coming out, I still didn’t know. He just…did it. I can’t connect with him as a character if I don’t understand his motivation. So, to help me try to figure him out, I read both the adult and junior novelizations of The Force Awakens, as well as a book that takes place before Episode VII called Before the Awakening, and a handful of other canon novels that discussed his upbringing. But really, they only highlighted how problematic his characterization is. According to the novels, the First Order has taken in all kinds of kids of all different temperaments and turned them into Stormtroopers. They are all raised the same way, and none of them can remember their lives before the First Order. Any young child that questions things or shows too much empathy mysteriously disappears, and the other children don’t think about them anymore. Once they get past this stage and reach their teens, they are fully brainwashed and devoted to the First Order. After that point, no one has ever defected. Not only has Finn made it this far, he is the best stormtrooper Phasma has ever seen, and she comments on his quality leadership skills. He engages in realistic training simulations – so realistic that Finn worries about his fellow cadets and insists on never leaving a man behind – during which he has no trouble taking out members of the Rebellion and watching them die. He genuinely sees the Rebellion as a group of evil terrorists. He is devoted to the First Order, which he sees as a champion for the downtrodden as they provide jobs, shelter, and food to orphans and other unfortunates. Then there is an abrupt change. Suddenly he feels doubt. Suddenly he feels empathy toward a cadet he’s supposed to see as a weak link. Suddenly he feels like going against his orders. Nothing triggers this change. It just happens, and he starts to wonder if there’s something wrong with him. Now, this would have been an interesting mystery if it was supposed to be a mystery. But all of this is presented as something we should accept and move on. The major aspects of his story are convenient rather than realistic. He’s even the only one on his squad who doesn’t have a nickname. Why? Because then, conveniently, Poe Dameron can be the one to nickname him, and the good guys will be his first step in gaining an identity. 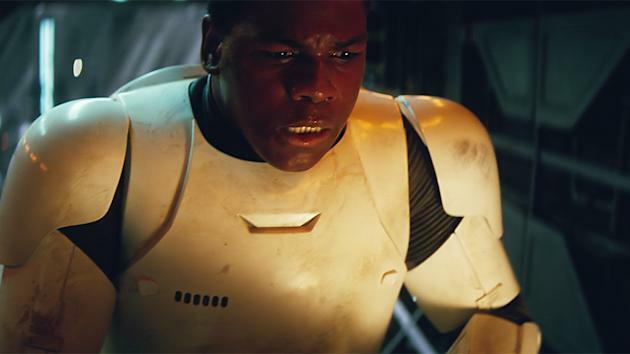 As we know, at the start of the film, Finn becomes the only stormtrooper to defect. But if he had the same upbringing and devotion to the First Order as everyone else, what makes him so special? And how does he have so little empathy that he thrived as a stormtrooper for so long, but also so much empathy that he completely and suddenly loses all nerve and loyalty during the attack on the villagers? What’s more, after he defects, he becomes strangely cowardly. The “best stormtrooper Phasma has ever seen” who has “quality leadership skills” is suddenly wringing his hands and doing whatever Rey and Poe tell him to do, even when it goes against his own judgment. It’s amazing how quickly he overcomes a lifetime of brainwashing and easily joins the side of people who, his whole life, he’s thought of as villains. His empathy – which is supposedly so strong it led him to be the only stormtrooper to defect – is strangely…moderate after he joins with Rey. He’s not heartless, of course. But he doesn’t seem any more empathetic or self-sacrificing than the average person you’d meet. Possibly less so, as most of his actions seem motivated more by self-preservation than anything else. What good things he does do are because he has a crush on Rey or because he has to do it to survive. Not that he’s totally selfish or evil or anything. He’s just…average. And as “the greatest stormtrooper Phasma has ever seen” and also the first of them to defect, average is the last thing he should be. At any rate, I’m hoping his motivations are more clear in the next movie. I mean, we didn’t establish a romance in seven; we never played it that way…Yes, Finn and Rey – they’re just friends. Finn is a storm trooper, so he doesn’t really know what’s going on. So the romance thing is something that’s going to be interesting in the next installment. 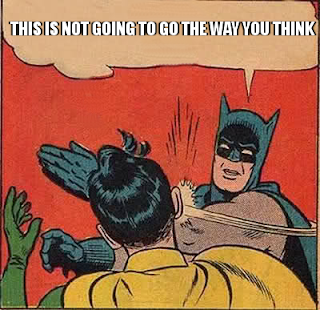 It’s not going to go the way you think it’s going to go. Star Wars is full of surprises. And it looks like Rey’s feelings for Finn may have changed now that he’s not the only other human in the galaxy she has to keep her company. Rey meets Finn and Finn is a stormtrooper, she’s a scavenger and they’re brother and sister[,] they [have] this amazing connection. This character could come straight out of a Bob Dylan or Tom Waites song, or even a Dostoyevsky novel. He’s like something out of Dickens; there have been characters like him in all kinds of literature. He’s like a knife: if you grab him by the blade, he’ll cut you. If you grab him by the handle, he can be very, very useful. Okay, I’ll admit it. I have a huge crush on Captain Phasma. She is my evil queen. This might be surprising to those who have only seen the movie. But I’d like to point out that she was terribly underused in the film. And while the canon novels only made me more confused about the heroes, they fleshed her out quite well. Phasma is this badass ESTP woman who was forced to become a warrior, as she was one of the few people on her dying homeworld who was strong enough to fight. A toss up between Slytherin and Gryffindor, she’s clever and will do absolutely anything to get what she wants. Courage and physical strength are the measures she uses to judge herself and everyone else. The majority of those who pledge their allegiance to the First Order typically fall into two groups – one, the well-intentioned folks unknowingly on the wrong side; and two, people who save their empathy for only their own friends and family and are willing to turn a blind eye to the suffering of people on the other side of the war if it means being able to follow their greed and passion for power. Phasma, however, seems to be the sole one among them to be a true sociopath in the clinical sense of the word. She does not understand or experience empathy. She’s made heavy sacrifices for the people who love her…and also betrayed those same people who love her – all depending on which was the tactical advantage at the time. Phasma has no loyalty to the First Order and is not the person they think she is. She is loyal only to herself and would happily defect if the other side made her a better offer. Believe me, she is not the by-the-books person she pretends to be. Phasma is a wild card. It’s not just the good guys who should be worried about her but the First Order as well. There’s a good chance she could be killed by Finn in the upcoming movie, since going up against her is probably going to define a large part of his character arc. But I really hope not since she has so much potential. She’s a human weapon who’s virtually impossible to beat in a fight. And underneath that, past her seriousness and sociopathy, is a clearly human and vulnerable person who never fails to fascinate me. Everything – from how she got her chrome armor to why no one has ever seen her face – has an interesting backstory behind it. I’m also quite fond of General Armitage Hux in both a love-to-hate and hate-to-love kind of way. He is basically this trilogy’s version of Tarkin, only he‘s way more ridiculous. Hux is like that snotty kid in your class who’s kind of weak but still ends up becoming the teacher’s pet because he tattles on all the other kids. You know, the kid who’s super fun to prank because he deserves it so much, easily falls for it, and always gives the best angry reactions. He’s an interesting character too and does things you wouldn’t expect. With his bad case of Screaming Nazi Face, you’d expect him to be an absolute dictator to anyone he can afford to shove around. But according to the canon novels, he’s quite encouraging to those beneath him and helps others succeed. In one book, a scared little girl is taken aboard a First Order ship. And while everyone else treats her like a mere piece of furniture and ignores her questions about what’s going on, Hux takes time out to talk to her and comfort her. That’s not to say he isn’t evil; he is, and has a strong ideological devotion to the First Order. He also has a very complicated relationship with his father that results in…well, I don’t want to spoil it (but do yourself a favor and read Phasma by Delilah S. Dawson). I think there's a good chance Hux will also die in the next movie (though, again, I hope not. He’s fun). And if he does, it makes me wonder who will be the one to take him out. If the rumors are true about him having a subplot with Poe, I suppose Poe would be the best candidate but the least interesting. Since Hux and Kylo Ren seem to have an ongoing rivalry (which, the filmmakers say, Snoke only encourages) it could be interesting if Kylo defeated him for some reason. Phasma being the one to off him might also be interesting. Hux basically treats her like his pet attack dog, and I’m sure she’d love to get him for that reason. And since she’s basically primed to betray the First Order anyway, that could be a cool way to show her treachery against her own perceived side. My number one theory right now is that either Kylo or Snoke himself will do him in. Saving Kylo Ren is possibly the most important aspect of this trilogy. Why? Because you’re right – Star Wars is a saga about the Skywalker family…and Kylo Ren IS your Skywalker. THIS IS YOUR BOY. Even if you don’t like him and don’t want him to be, he is our Skywalker and he’s being brainwashed by Snoke. So it’s time to bring him back home. I don’t know how I can make this any clearer. It’s more than just having a ‘bad seed’ as a kid. Snoke had targeted this kid and knew that this kid was going to be incredibly powerful in the Force and wanted him as an ally. It’s not like Kylo is our Vader. In the original trilogy, Vader is the father — he’s the one you’re afraid of and who you want the approval of. Whereas Kylo represents anger and rebellion, the sometimes healthy — and sometimes not — desire to disconnect from the parents. It’s my favorite kind of quote-unquote bad guy, because you can genuinely see what their weakness is. It’s not about imagining doing what the character is literally doing on screen…You relate to Luke although you’ve never fought in a galactic army or been behanded by your half robot father. We relate to characters because they reflect our inner experiences in a heightened way…To say it’s dangerous to recognize darker fragments of our psyches in characters negates the power (and arguably the purpose of) storytelling. Kylo Ren needs to be saved. The question is, will he be? And if so, will it be in this movie? At first, I thought, being in the middle of the trilogy, this film would only make him darker and his entire redemption arc would be saved for the next film. But everything I’m seeing makes me suspect at the very least, he’ll take some steps in the direction of becoming Ben Solo again. One possibility is that, while not turning entirely good, he might agree to an arrangement with Rey to go up against Snoke if he becomes their common enemy. The biggest question on people’s mind concerning Kylo seems to be whether or not he’s going to kill Leia. I’m not even wondering about that; it’s pretty obvious that he’s not. There’s absolutely no plot reason for him to do so. If he’s headed toward redemption, killing his mom will only make it even harder for filmmakers to pull off. And he’s not headed for redemption, and the filmmakers want to make him more evil, having him kill his mom would just feel like a repeat of the last movie. We’ve already seen him get darker due to killing a parent. Either way, it’s not happening. What I’m curious about is whether or not he’ll kill one of his own knights to save Rey, as her Force vision seemed to suggest. When Reylo (Rey/Kylo) shippers jumped out of the woodwork upon TFA’s release, insisting the two had something beyond a typical heroine/villain relationship, many people were skeptical. It turns out, however, they were right about that deeper connection. And while we still don’t know if the relationship is romantic, platonic, or something else entirely, we do know that it is central to the film’s story. The center of this story is Rey and Kylo Ren. They stand on the opposite sides but the boundary in between is very thin. There are light and dark inside both of them. Actually, they are not far apart. They are the other side of each other. As Rey’s abilities increase, so does a strange and seemingly unprecedented connection in the Force that spans across the galaxy to unite Kylo Ren and Rey. The bond is powerful and gives Rey insights into Ren that not even Skywalker can see. The Force Awakens novelizations insinuate there may be more to Rey and her relationship with Kylo than meets the eye. And whatever it is, Kylo knows something about it. He seems to be expecting someone to come into his life and suspects Rey is the person he’s been waiting for. At one point, while watching Rey, he even says, “It is you!” What’s also interesting is that the junior novelization points out Rey discovered how to use her Force powers only after meeting Kylo. It’s as if their power is attached in some way. Rian Johnson is often quoted as saying “They are two halves of our protagonist.” Think about that. They (plural) are two halves of our protagonist (singular). This is an odd choice of wording and makes it sound almost as if Rey and Kylo are somehow the same person, broken into two separate halves. What might that mean? If the theory is true, it would completely change the way Star Wars has treated the Force. Originally, there were no two sides of the Force. There was no “Light Side.” There was only the Force itself. And the term “dark side of the Force” was just an expression used for when someone used the Force in a way they weren’t supposed to. What’s more, the Dark Side was supposed to be like a cancer that one should never go near. Many misunderstood the phrase “bring balance to the Force” as a call to find a middle ground between dark and light, but this was never meant to be the case. In fact, originally, the idea of a good middle ground between the two would have been laughable. It would have been like trying to bring balance to your body by finding a middle ground between having good health and having cancer. The real answer is to get rid of the cancer so your body can feel balanced through good health. The same is true of George Lucas’s original intent for the Force. Balance was achieved by destroying the dark side entirely so that only the Jedi remain. Anakin's offspring redeem him and allow him to fulfill the prophecy where he brings balance to the Force by doing away with the Sith and getting rid of evil in the universe. That’s why this theory about Rey and Kylo is such a big deal. It completely changes the message of the story that Lucas originally intended. And while I am usually against decisions that go against the original wishes of the creator, I am all for it this time. Because the truth is, the original message was…maybe not the healthiest thing to teach audiences. The dark side didn’t just represent evil and greed and power. It also represented emotion, passion, connection, and close relationships with other people. And the original message of Star Wars was that these should not only be avoided but destroyed. On a side note, while doing research for this article, I came across some avid Star Wars fans who embraced Jedi teachings as their own religion. They said according to the Jedi code, all attachments, no matter how seemingly positive, lead to the dark side, and that they hoped that if they spread the message of Star Wars, it might inspire others to abandon their love for their children, other family members, and friends, so they can finally lead a healthy life without attachment. Yeah. The sad part is they’re not really representing the Jedi Code all that inaccurately. We’re talking about a film franchise where a young Anakin Skywalker is shamed by the Jedi Council for missing his mother. Where an older Anakin falls to the dark side because he wants to save his wife and children. And where Luke Skywalker is portrayed as selfish and immature because he refuses to abandon his friends when he learns their lives are in danger. Maybe it’s time we realize that, while it’s possible to go to extremes in anything, it’s not a bad thing to love others with passion, to be willing to go to great lengths to help people, or to embrace one’s own emotions and humanity. And if the signs surrounding Rey and Kylo Ren are right, that might just be the path Star Wars is leading us toward. Reylo: it’s the hip new Star Wars that lets you love your children. He’s definitely not a Sith, but he’s certainly at the darker end of the Force. Without giving too much away, that begins to unfold a little in this one…Snoke is bloody dark; way darker than Palpatine. He’s riddled with this osteoporosis so his body's twisted, like a corkscrew. He's incredibly damaged, so there's a bizarre vulnerability about him. Beneath that vulnerability, though, is this intense hatred. Serkis also revealed that Snoke, too, seemed to have some kind of tragic backstory. He’s terribly powerful, of course. But he is also a very vulnerable and wounded character…His hatred of the Resistance is fueled by what’s happened to him personally. Similar to with Rey’s parentage, Snoke is here to serve a function in the story. And, you know, a story is not a Wikipedia page. For example, in the original trilogy, we didn’t know anything about the Emperor except exactly what we needed to know, which is what Luke knew about him, that he’s the evil guy behind Vader. But then in the prequels, you knew everything about Palpatine because that his rise to power was the story. We’ll learn exactly as much about Snoke as we need to. But the really exciting for me is we will see more of him, and Andy Serkis will get to do much more in this film than he did in the last one, and that guy is just a force of nature. I suspect that, just like Rey’s parentage, Snoke’s identity and backstory will be more interesting than impactful. Still, I’m looking forward to seeing Andy Serkis’s performance. For those of you who don’t know yet, Luke Skywalker is my son. He’s always been my favorite character in the entire saga, as well as a huge inspiration to me. So, of course, he’s the one I’m most nervous about. He’s not acting like himself lately. The Luke I know would never hide on an island while his friends are in danger. So Rian Johnson will have to do a lot to convince me this is the same character I knew and loved from before. As for why he wants the Jedi to end, I don’t think he’s become a Sith or anything extreme like that. I think he feels guilt over past mistakes. What’s more, his worldview may have changed dramatically thanks to a book that fans spotted in a photograph. 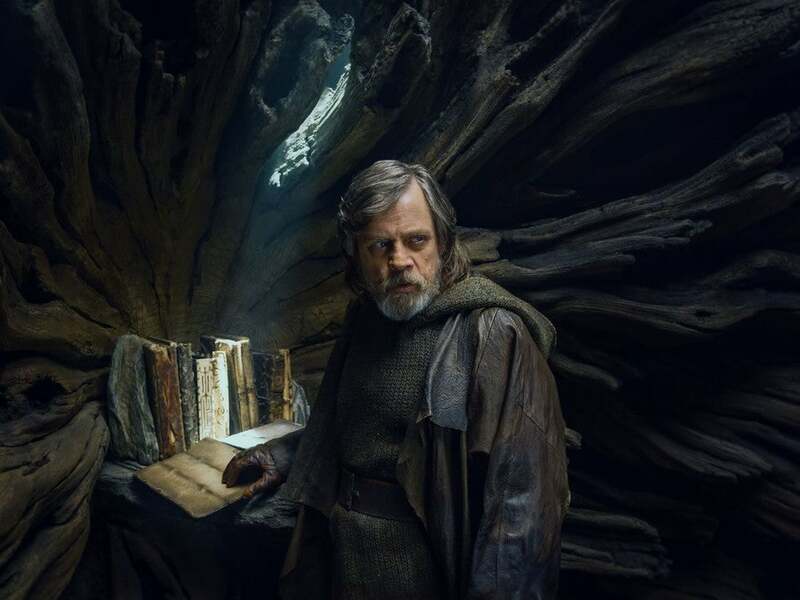 Luke owns the infamous Journal of the Whills. The Whills were semi-divine beings, one with the Force but neither on the light or dark side, who documented the history of the galaxy. The Journal of the Whills is basically the Bible of the Star Wars universe. And whatever he’s read of it must have given him a new perspective of some kind. Lots of rumors swirl around his character. He apparently owns a red kyber crystal which is causing a lot of speculation. What’s more, filmmakers have confirmed there will be new lightsaber colors, and many people theorize Luke may end up yielding one that’s colored white. The media has been obsessed with Porgs lately. Rian Johnson created them as cute comic relief for the film, but also wondered how long it would take for people to hate them. The same question is on my mind. I suspect they will soon become like the Minions of Despicable Me – showcased everywhere while people would rather they go away. I’m afraid they may become the next in line after the Ewoks and Jar Jar Binks as the most loathed Star Wars characters. 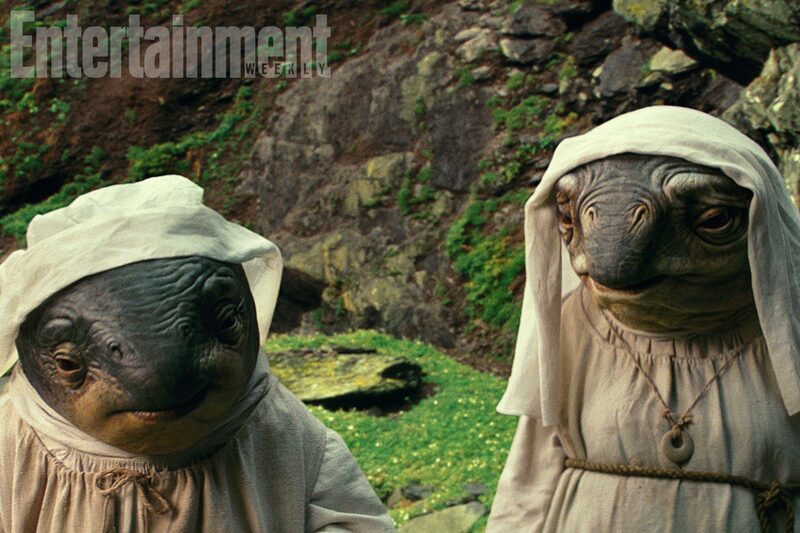 While I have mixed feelings on Porgs, I’m quite excited to see the other new species the film will introduce, such as the ice fox seen in the trailer, and these mysterious frog-like creatures. I think everyone knows there will be some big twist in The Last Jedi. Interviews with the filmmakers have revealed that, whatever it is, it will be dark and even more extreme than the “I am your father” reveal from the original trilogy. Something that will change Star Wars forever. Many people are expecting the big twist to be Rey’s parentage or Snoke’s identity. 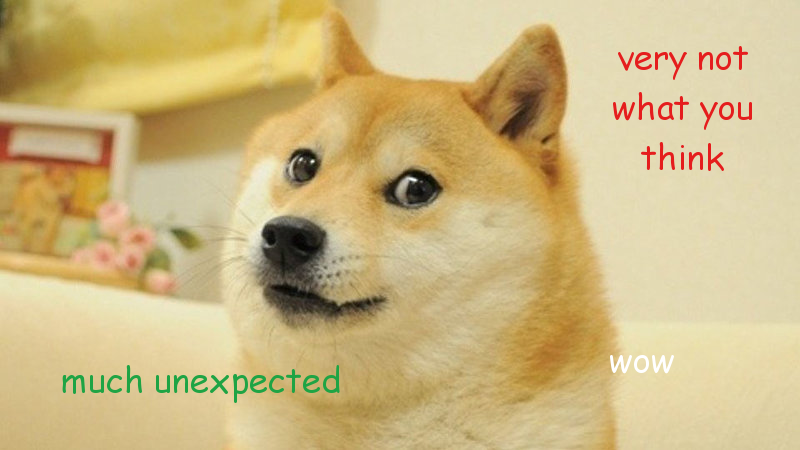 But as we know, things aren’t going to go the way people expect. And I’ve explained in previous sections why those subjects are unlikely to be the big reveal. At first I thought maybe the balance to the Force brought about by Rey and Kylo’s joint greyness might be the big twist. But while this would change Star Wars forever, it’s not particularly dark. And since the filmmakers have already been pretty upfront in interviews about Rey and Kylo having a strong connection, I doubt that will be the major twist. I can’t help feeling there’s something more. Some missing piece. I started mulling it over. I remembered this movie is called “The Last Jedi” and Rian said the title is referring to Luke. I remembered the story JJ Abrams told about how he initially joined the project. He said he was hooked by the line “Who is Luke Skywalker?” Surely, I thought, the big twist must have something to do with Luke then. Whatever they mean by asking “Who is Luke Skywalker?”, it must be something that is revealed in this movie. The filmmakers are following Lucas’s wishes of the trilogies mirroring each other. So whatever the big twist is, it has to echo the original “I am your father“ moment, yet somehow be even more extreme. I started thinking about that moment in Episode V, asking what made it so memorable. It wasn’t just the fact that Darth Vader was Luke’s father – it was what that meant to Luke. His entire motivation up to that point was aspiring to be like his father, who he had been told was a good man. Darth Vader’s revelation to him was meaningful because it stole his hero away, revealing everything he thought he knew was a lie, and that he would have to find something new to drive him forward in the future. I think this is what is going to happen in The Last Jedi, only this time it will be worse. I think we are going to learn that Han, Leia, and especially Luke are not the people we thought they were. We already know they are fallible people who make mistakes – that’s why Luke decided to hide on an island and why Kylo doesn’t think Han and Leia were good parents. But I’m talking about something more than that. Not that I think they are evil Sith lords either. I’m talking about something in-between, but emotionally impactful. I think they’ve done something bad that goes beyond a well-intentioned error that will reveal they are not good people and perhaps never really were. I don’t know exactly what it will be. Perhaps they always had selfish intentions when we thought they were being selfless. Maybe Luke tried to torture Snoke’s influence out of Kylo, and one of the torture sessions resulted in the temple destruction. Perhaps Luke, Han, and Leia had something to do with Snoke’s tragic backstory. I don’t know. The point is, whatever it is, it’s going to be very bad. And you know what the worst part will be? It’s going to be done well. You won’t be able to say, “Luke, Han, and Leia would never have done this! This isn’t canon to me. It’s no better than somebody’s bad fanfic!” You won’t be able to hand-wave or headcanon it away. All attempts to ignore it and focus only on the original trilogy will fail because the terrible reveal will be executed so seamlessly and incorporate so much of what you thought you knew about the characters, you won’t be able to not see it anymore, even while watching Episodes 4-6. You will never be able to forget what you now know about these people you used to like. It’s the only explanation that fits every qualification. It explains why the question “Who is Luke Skywalker?” gave JJ Abrams chills and drew him to the project. It explains Luke’s solitary behavior, and why the movie is ominously named after him. It explains how the son of Han and Leia could turn against them so harshly. It accurately fit’s the description of “a dark plot twist that will change Star Wars forever.” And it mirrors the plot twist in The Empire Strikes Back while simultaneously being more extreme. It’s more extreme because it’s more personal – instead of Luke being the one to lose his heroes, it’s us. And he is the hero being lost. This is my big Star Wars theory. And I really hope that I’m wrong. So what are my overall thoughts on the upcoming Star Wars film? I’m excited…and terrified. My hopes and my actual expectations conflict. It’s funny, a long time ago, my biggest worries were about my ship and whether or not Kylo Ren would be portrayed sympathetically. I was afraid the movies would focus only on the heroism of the other characters and just dismiss him as a villain that needs to go down. Now I have more confidence in these aspects of the film than anything else. There’s a reason the director has been nicknamed “Reylo” Johnson. He’s infamous for supporting shippers and sassing antis. Sometimes I think he ships Rey with Kylo even harder than I do. Regardless of whether their relationship becomes explicitly romantic, I’m sure Rian will portray it well. And as the director is famously in favor of redemption stories, I trust Ben Solo being in his hands. 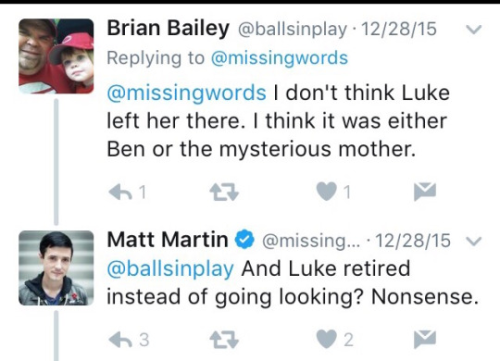 But while I trust Rian Johnson with my ship and the redemption arc, I’m not sure I trust anyone with Luke. I have bad feelings about where his character arc may be heading. 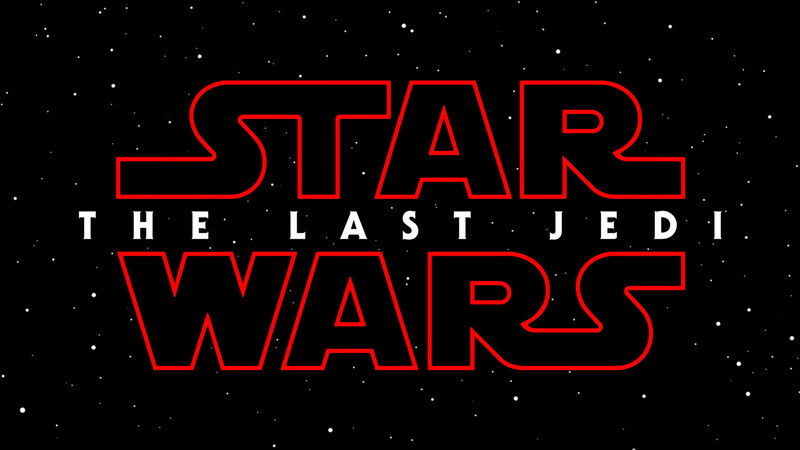 So, what do I want from Star Wars: The Last Jedi? Well, most of all, I want to be wrong about my big theory. I hope that all Han and Leia did was focus too much on their careers to notice their son being targeted by Snoke. I hope Luke only made small, well-intentioned mistakes that were only magnified in Kylo’s eyes because of Snoke’s influence. I hope Luke only hides on his island because he is afraid of making further mistakes – because he cares too much rather than too little – and that he’ll eventually come around to his old, ready-to-save-the-galaxy self. In the end, though, I have a lot of confidence in Rian Johnson’s writing from what I’ve seen of it. Whether or not everything goes exactly as I want, I’m sure it will be a fantastic film. What are your theories about the upcoming Star Wars film? Let us know in the comments!